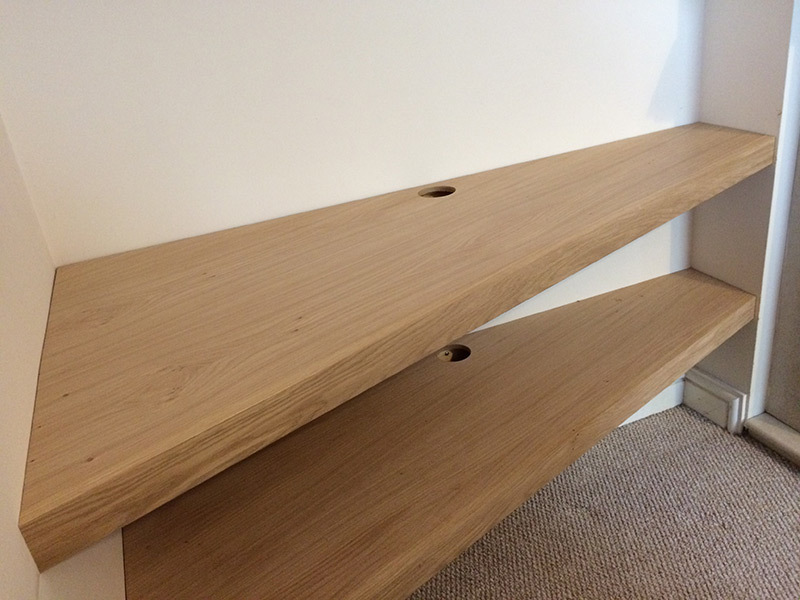 These are a few examples of pieces of built-in furniture I have designed and made. 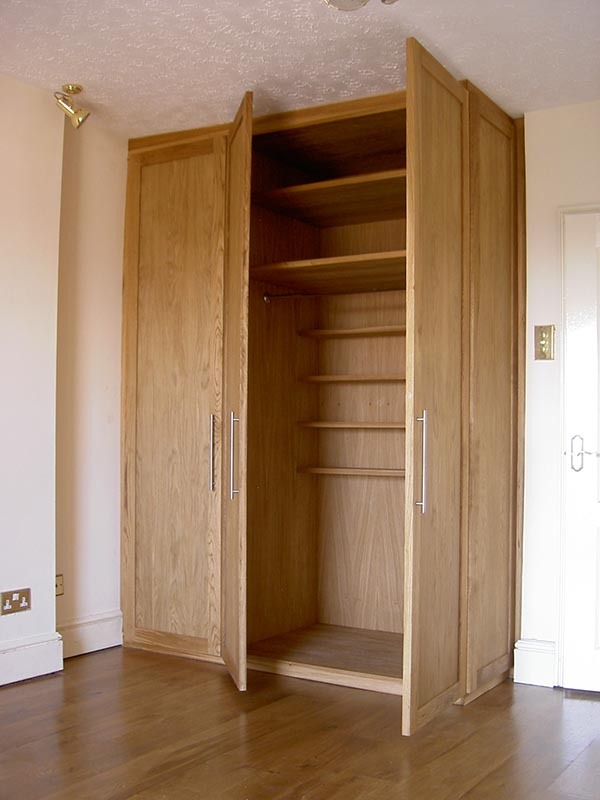 They include built-in cupboards, shelves and wardrobes and each has been designed to help make the most of the living space available. 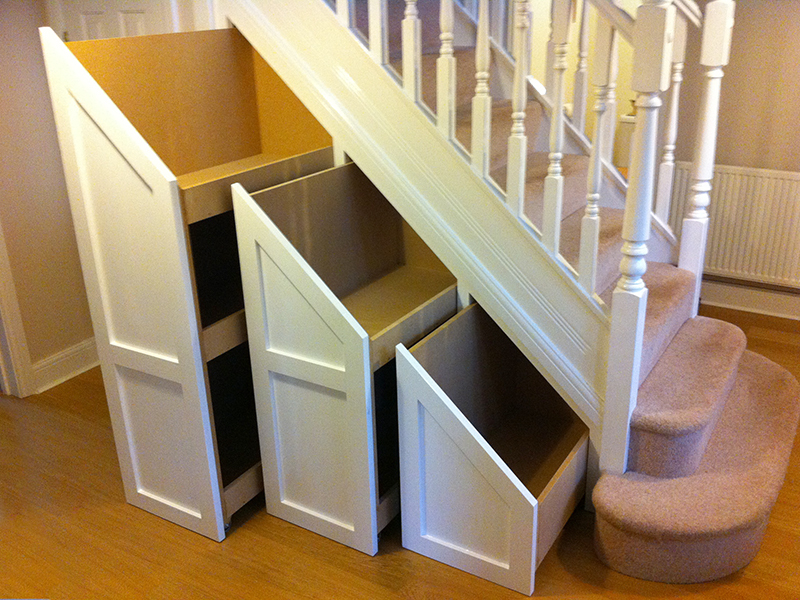 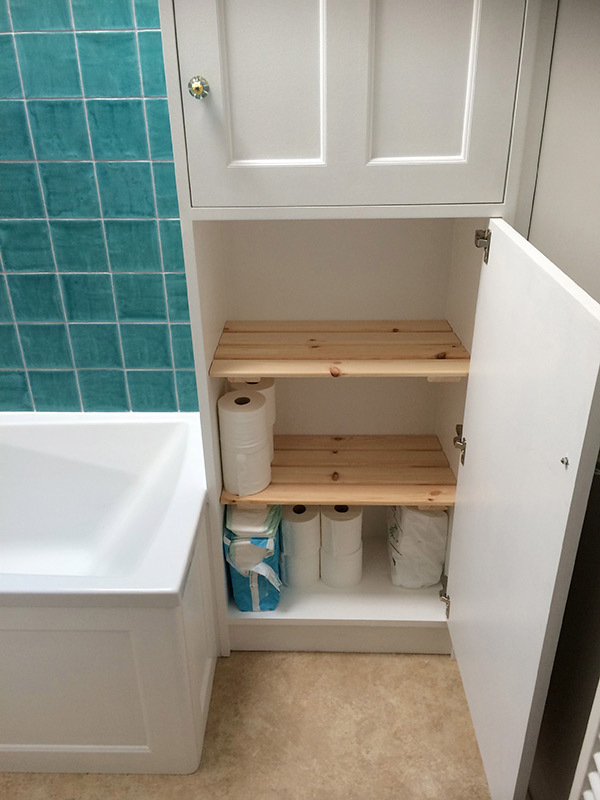 Perhaps you have an unused alcove, an awkward corner or a tight corridor space that you’d like to make use of. 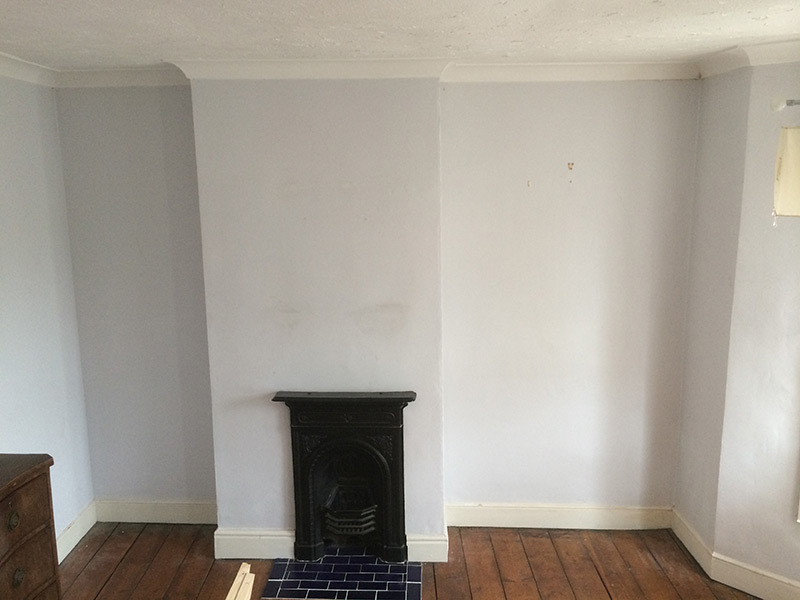 Get in touch and let me see if I can help. 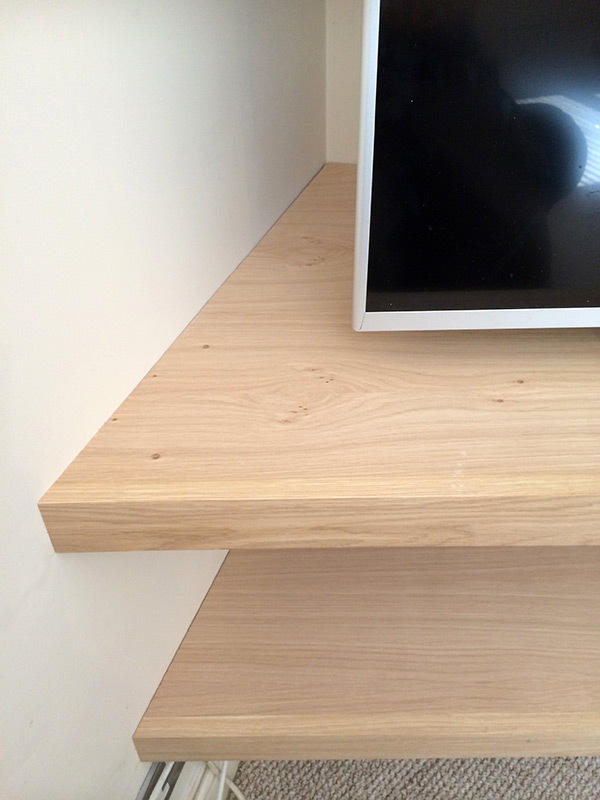 Click a thumbnail to see more images of built-in furniture. 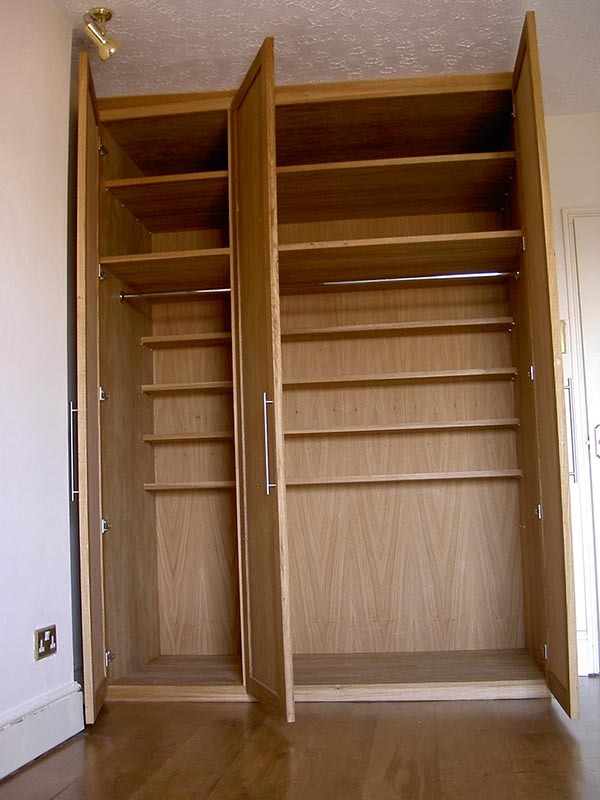 Unusually tall cupboards at 1.2m high. 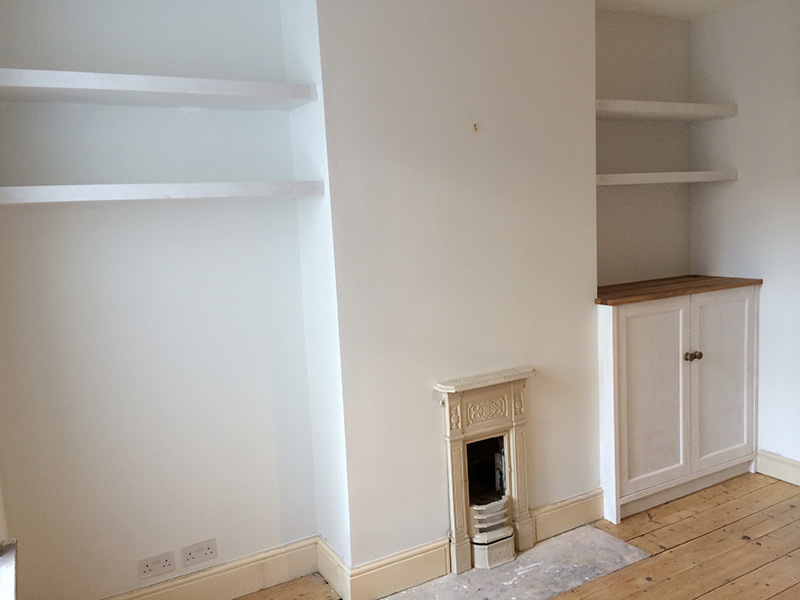 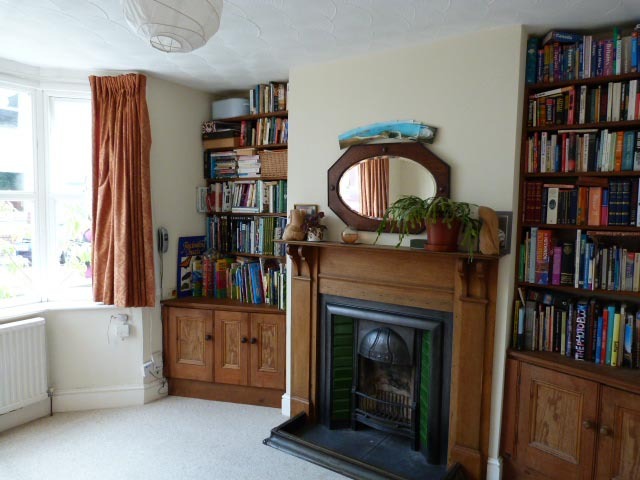 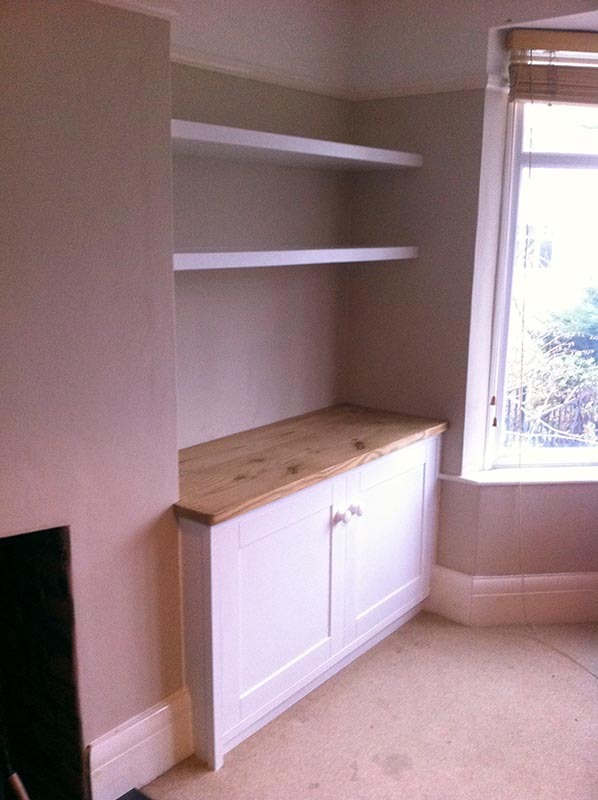 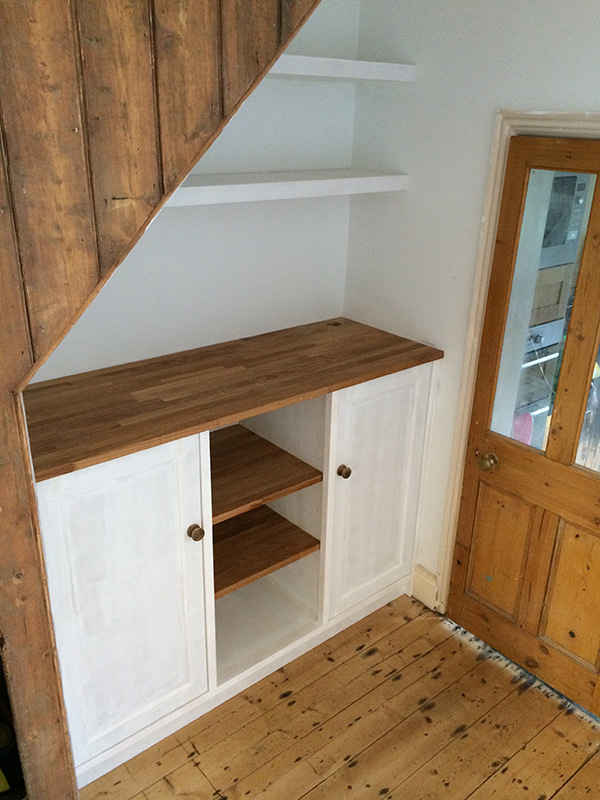 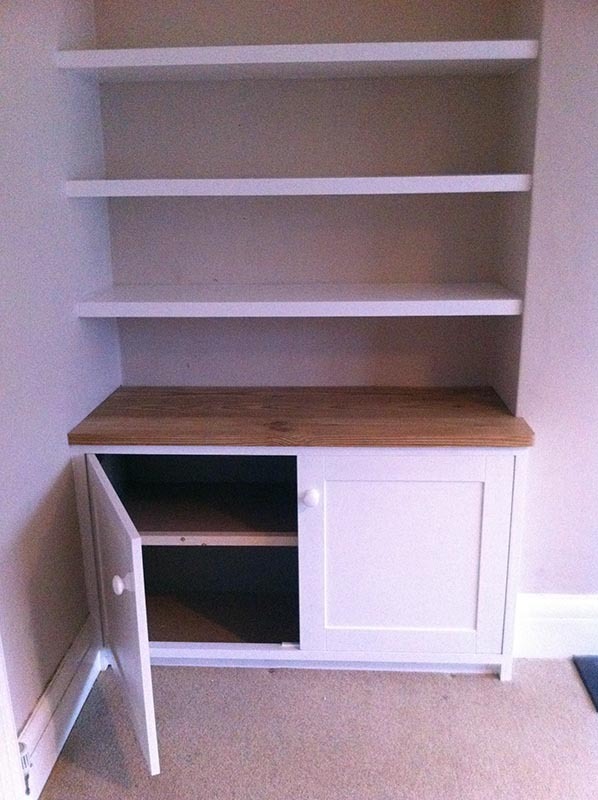 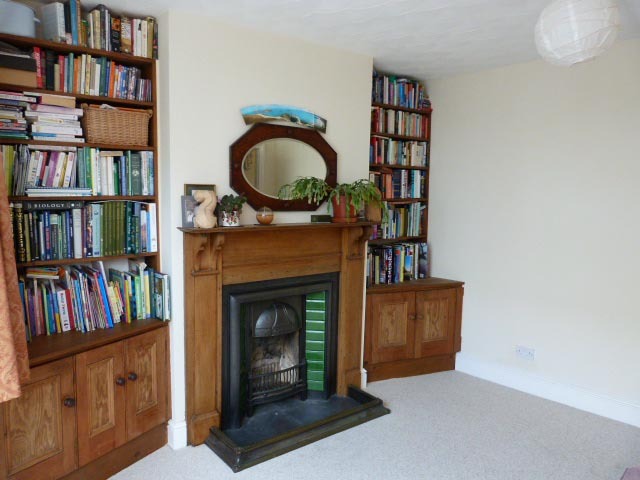 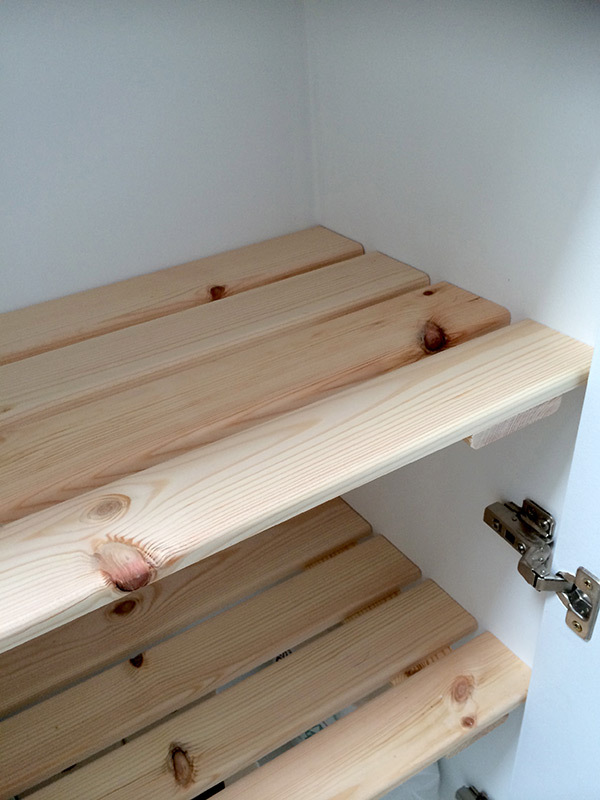 With floating shelves above, soft close doors, moveable cupboard shelves. 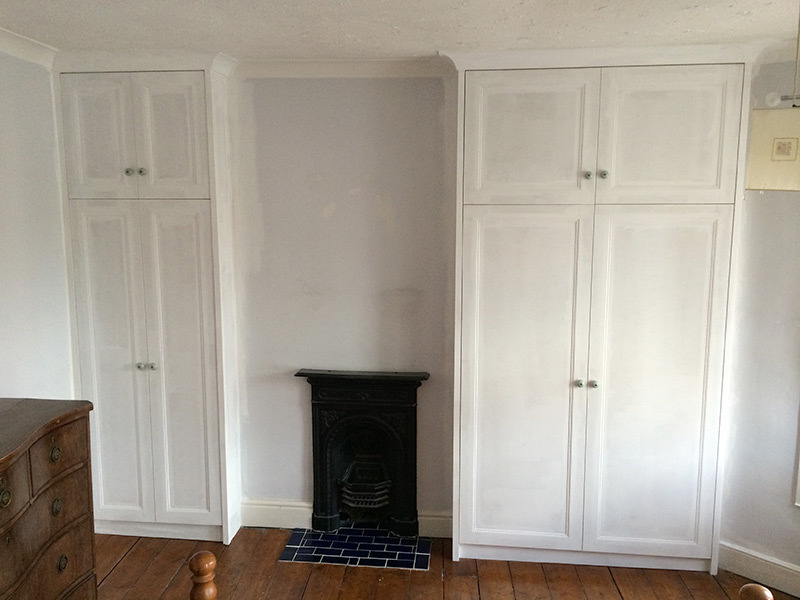 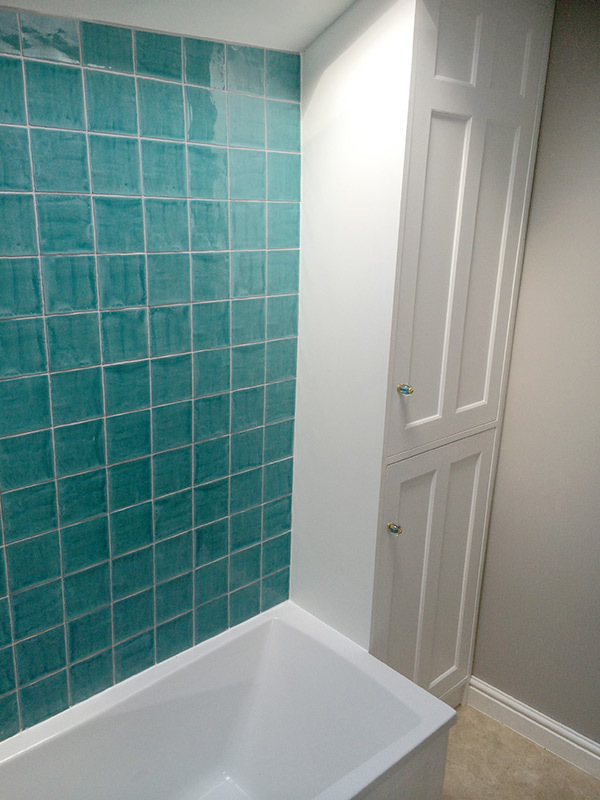 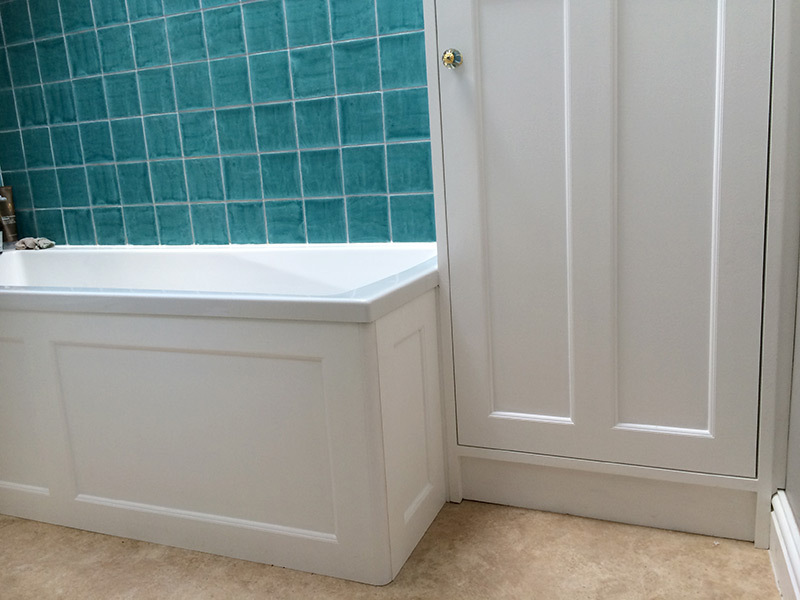 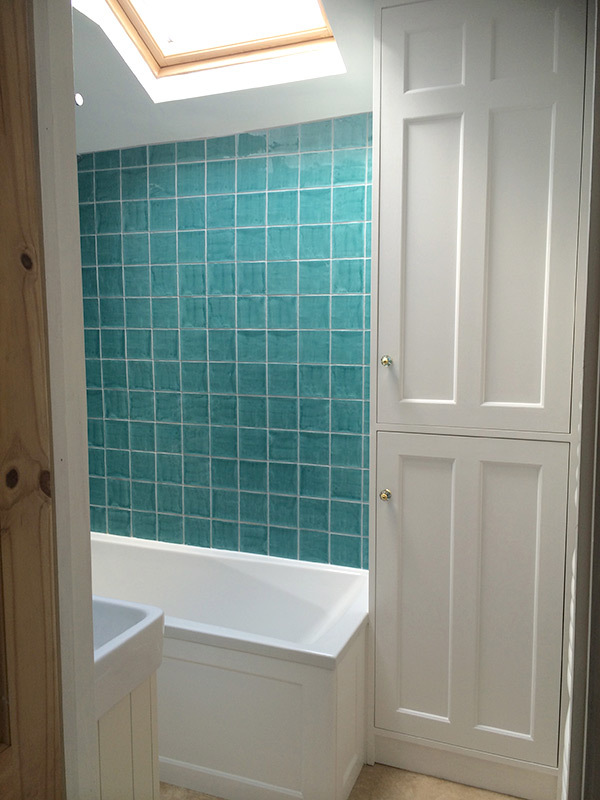 Fitted bathroom cabinet and bath panels in a room with very wonky walls, floor and ceiling. 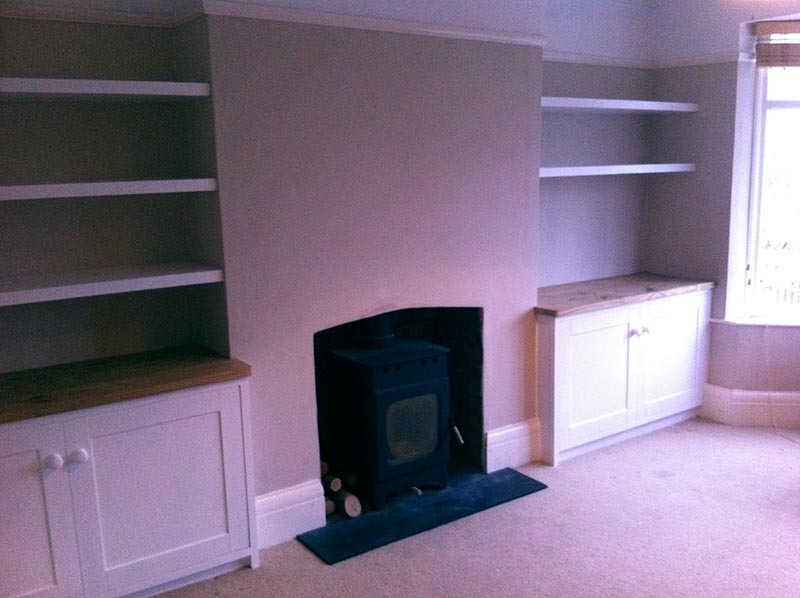 Hopefully, you can't really tell! 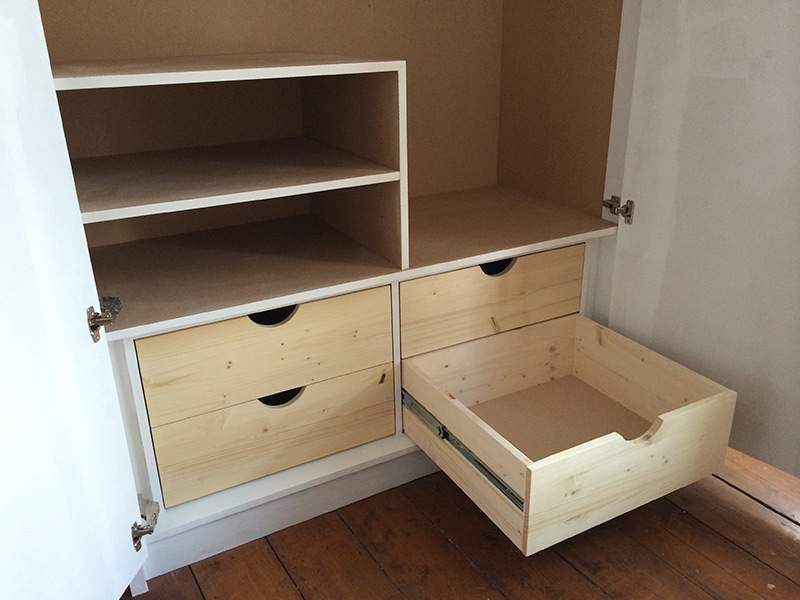 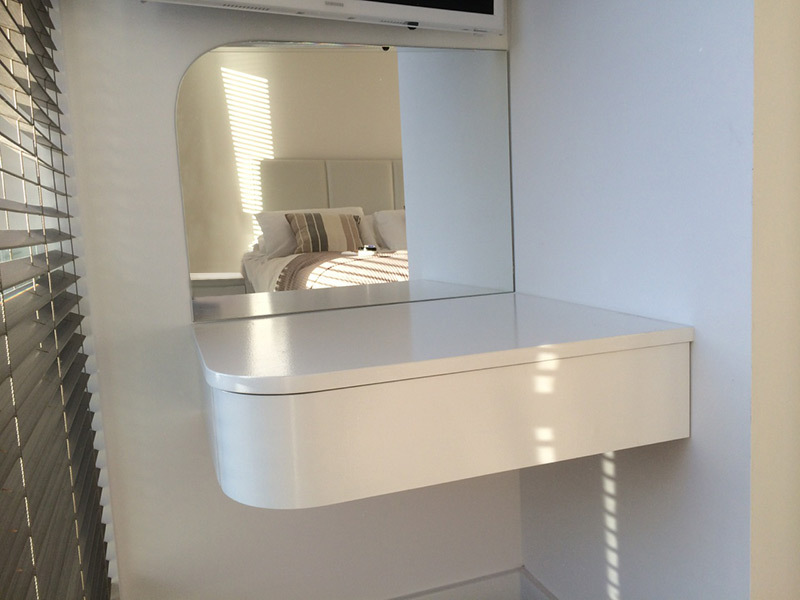 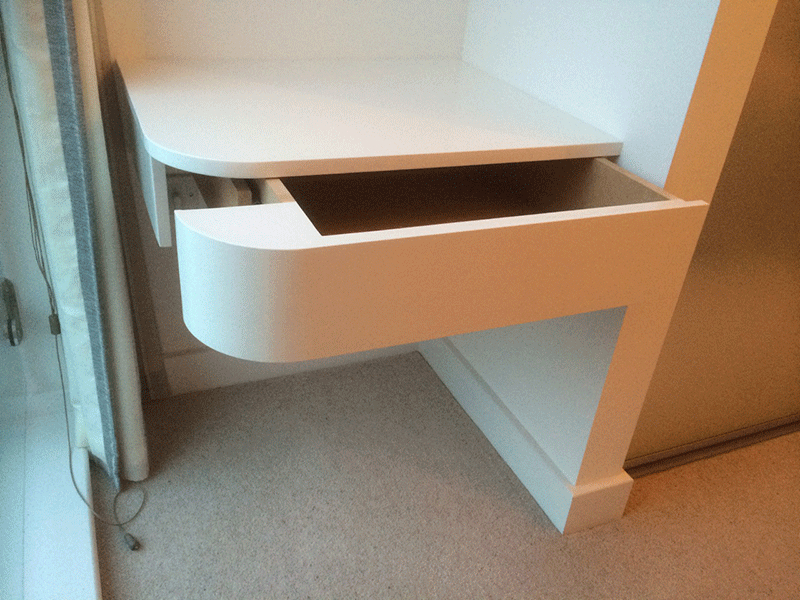 Self closing concealed drawer and mirror with matching radiused corner. 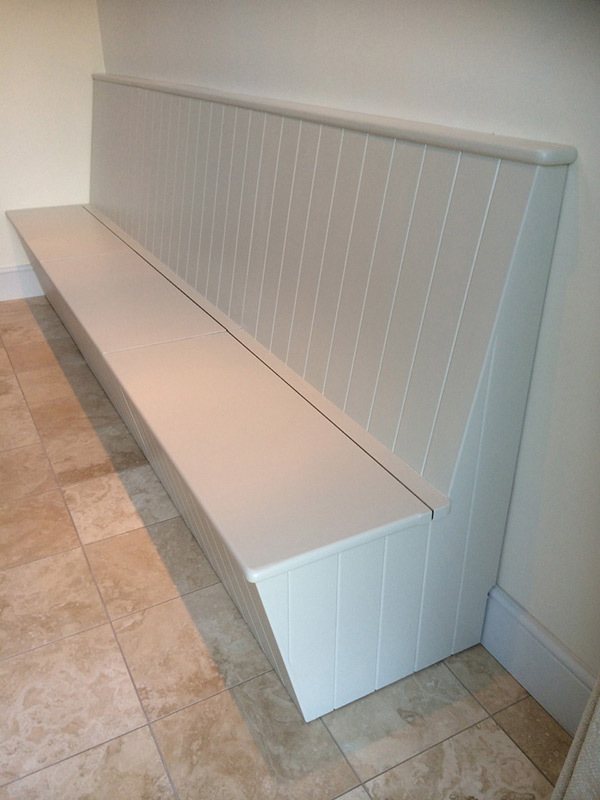 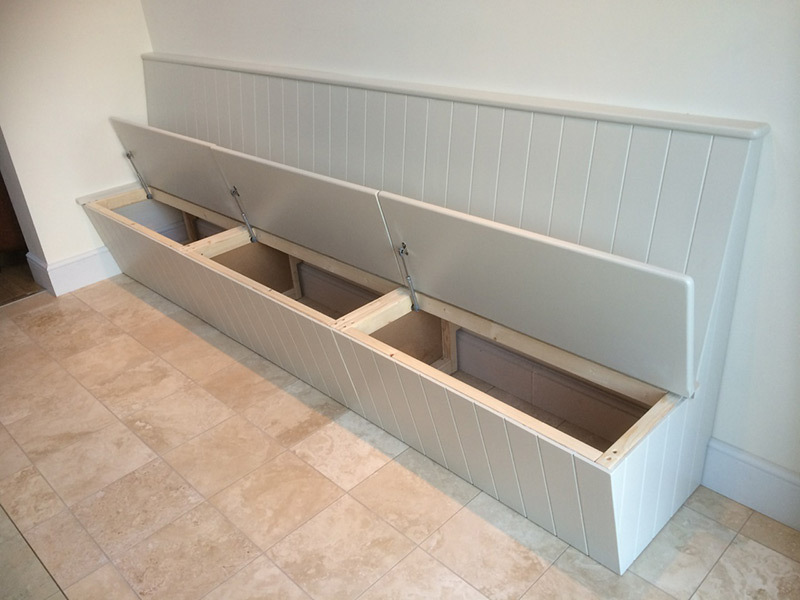 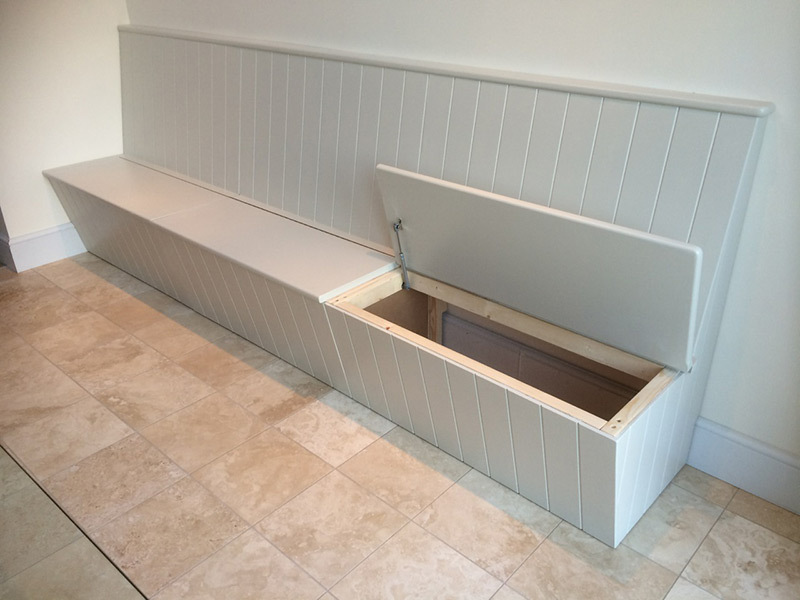 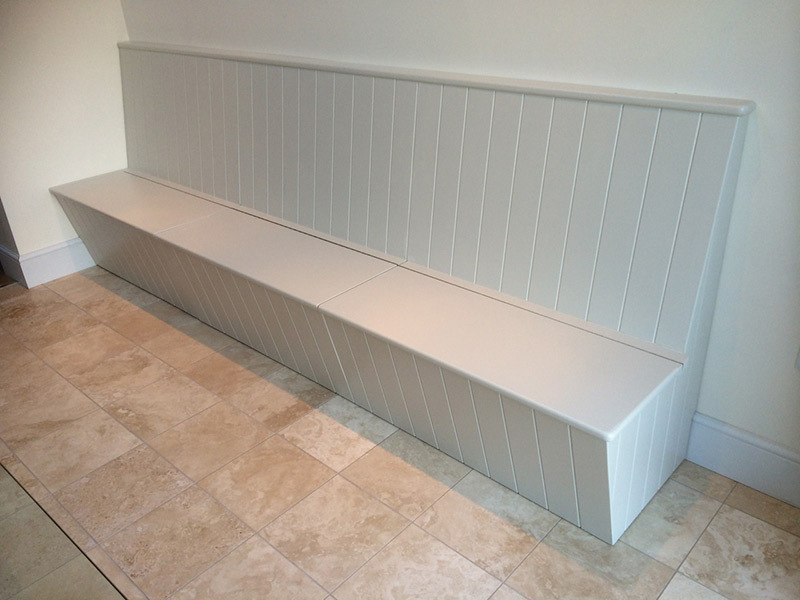 Three metre long bench with under seat storage. 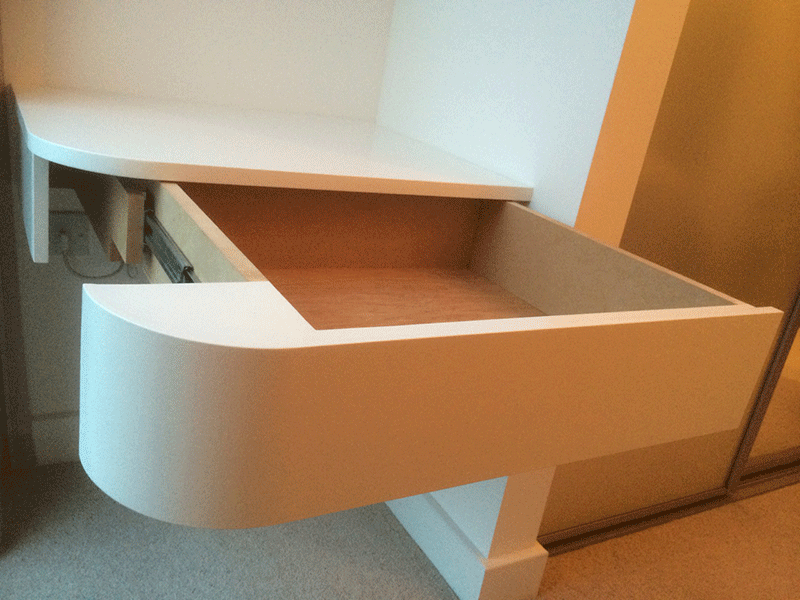 The seat/lids have soft close arms to avoid squished fingers! 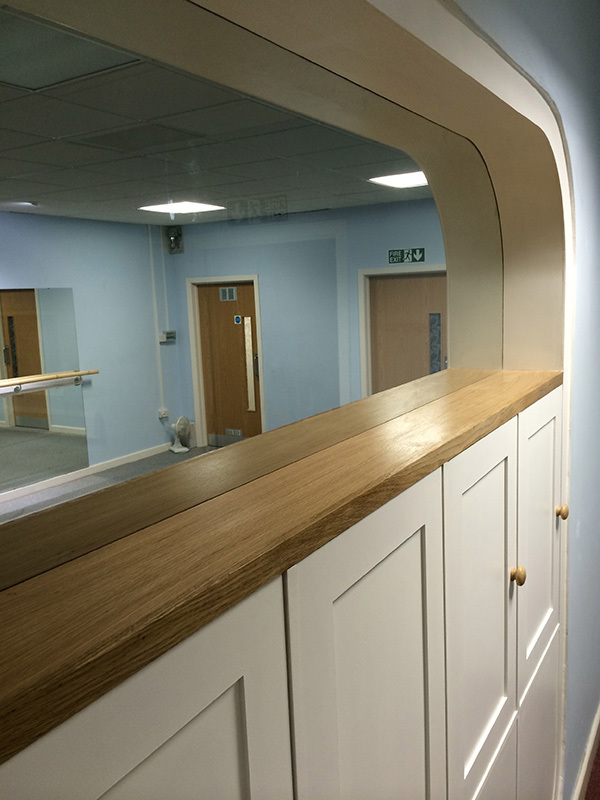 Softwood frame, painted moisture resistant MDF and oiled Mahogany top. 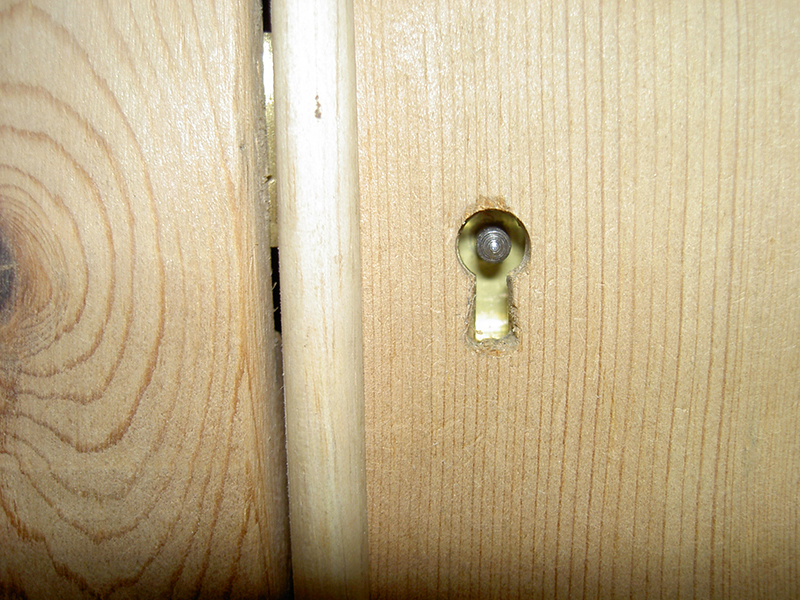 The door has a hidden push catch to avoid the need for a handle or knob. 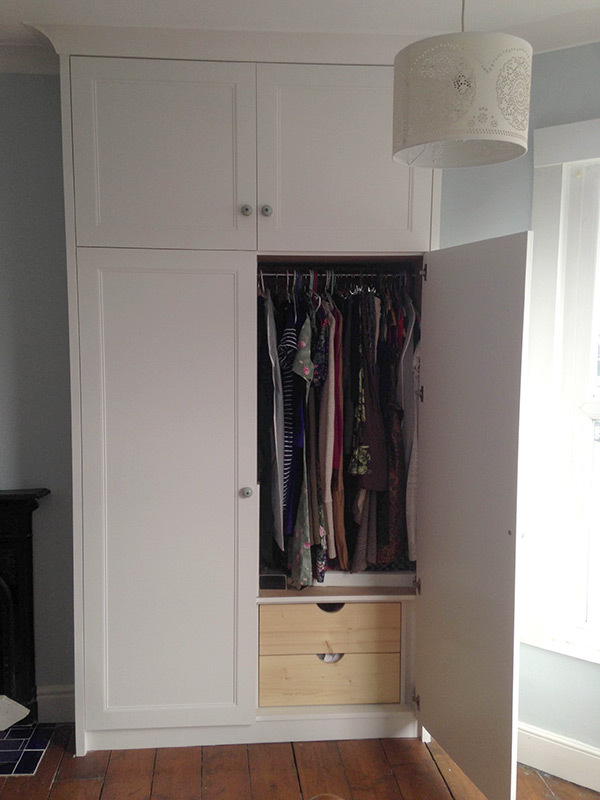 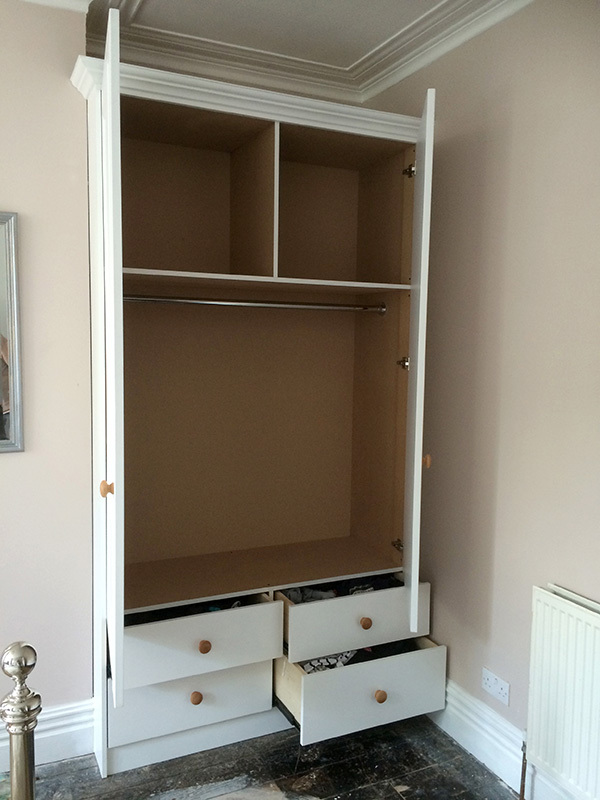 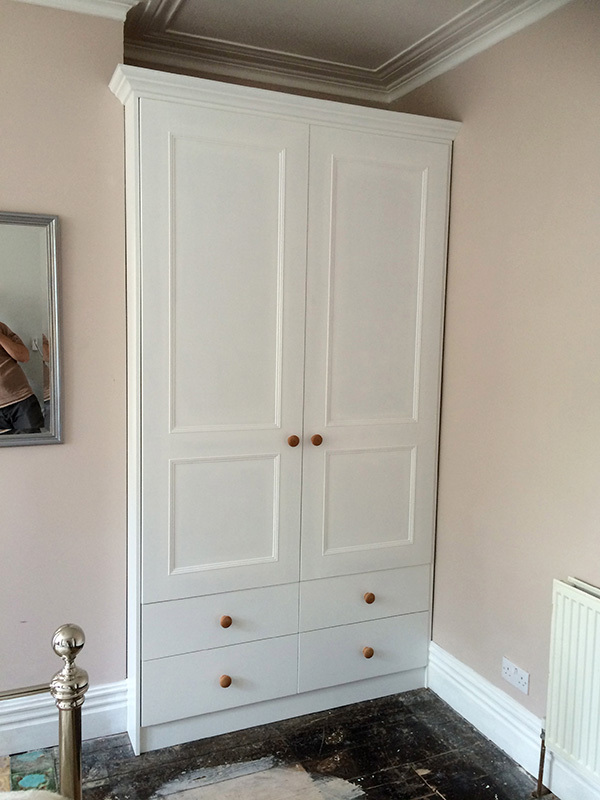 MDF and softwood wardrobes with soft close doors and drawers. 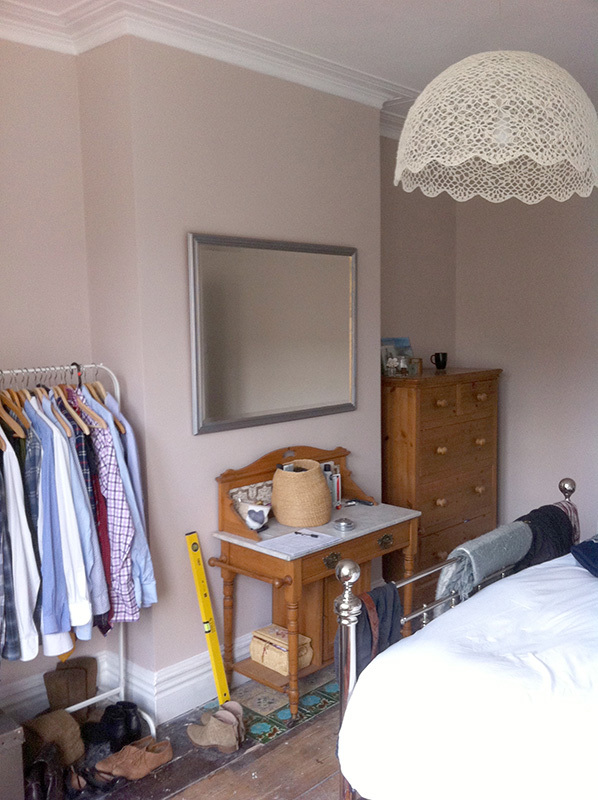 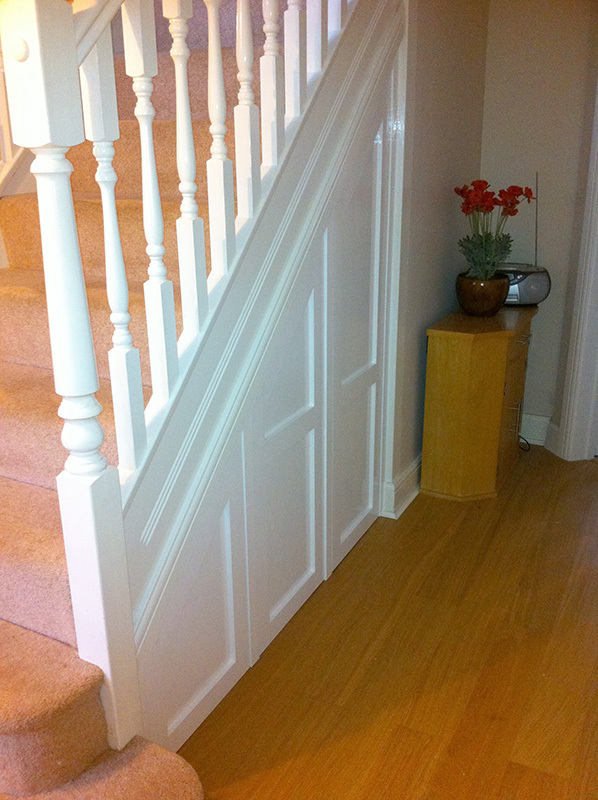 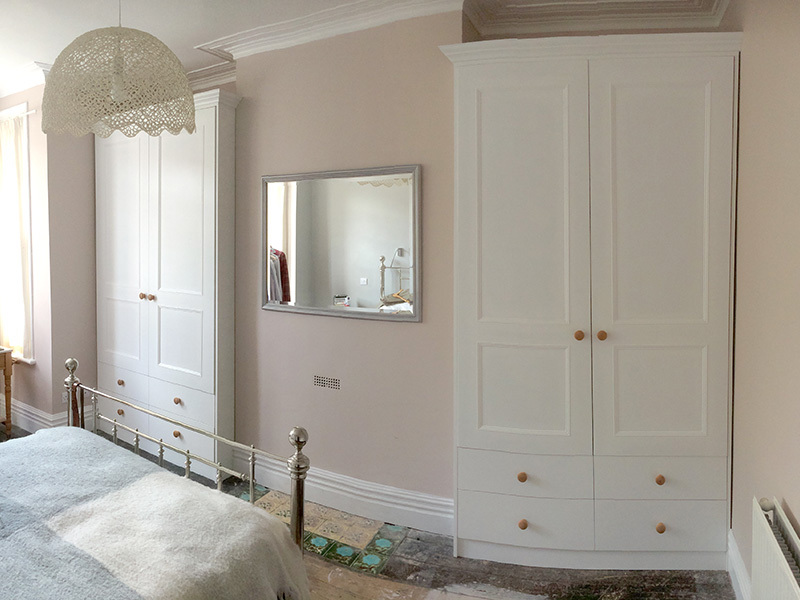 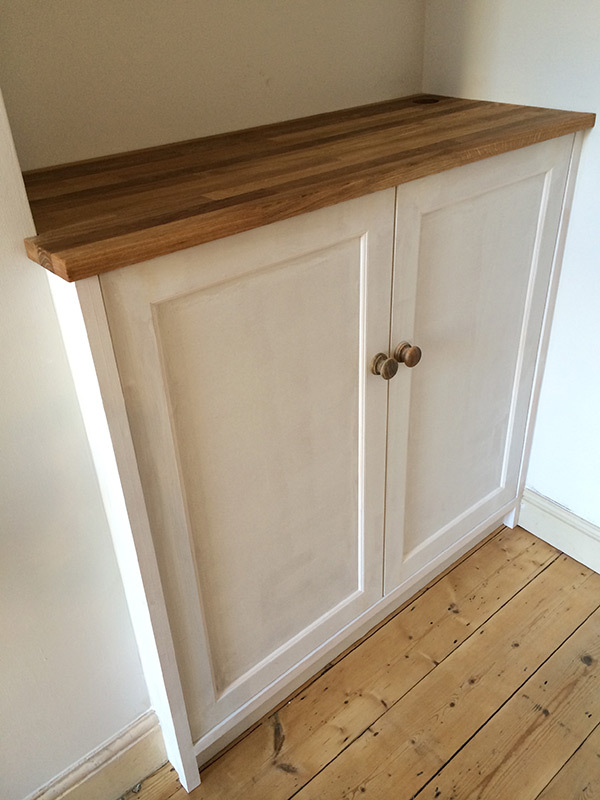 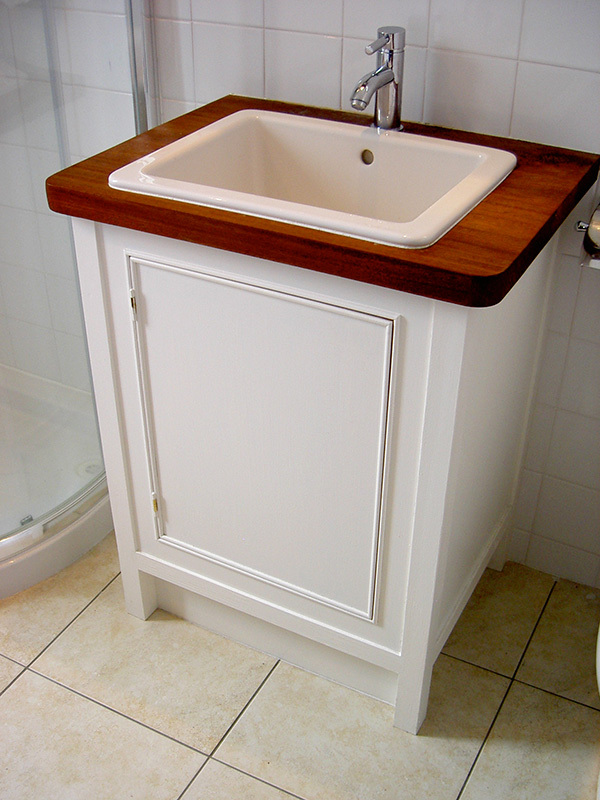 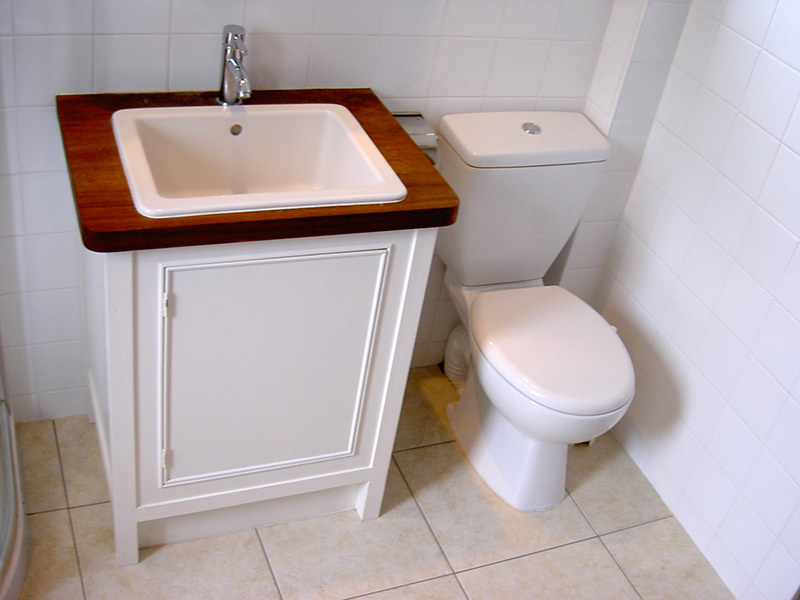 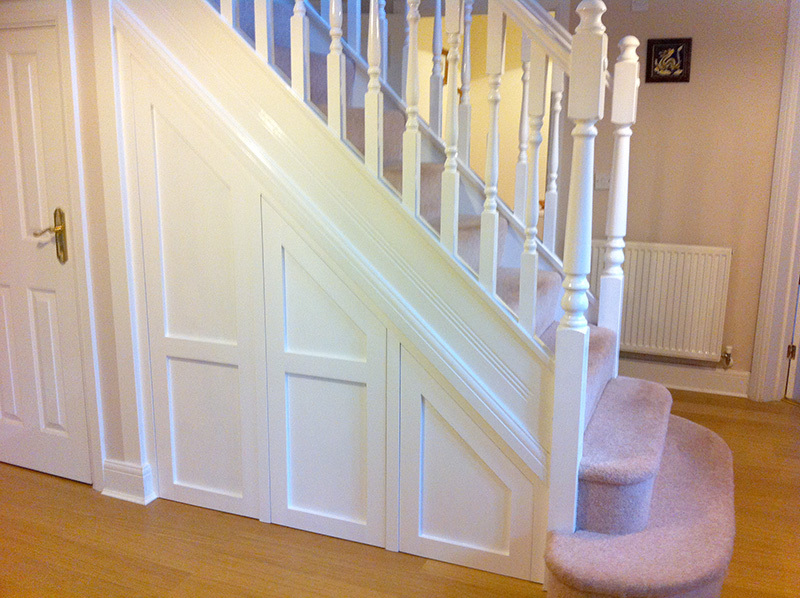 Painted satin white with oiled Beech handles to match existing room decor and furniture, interior left unfinished. 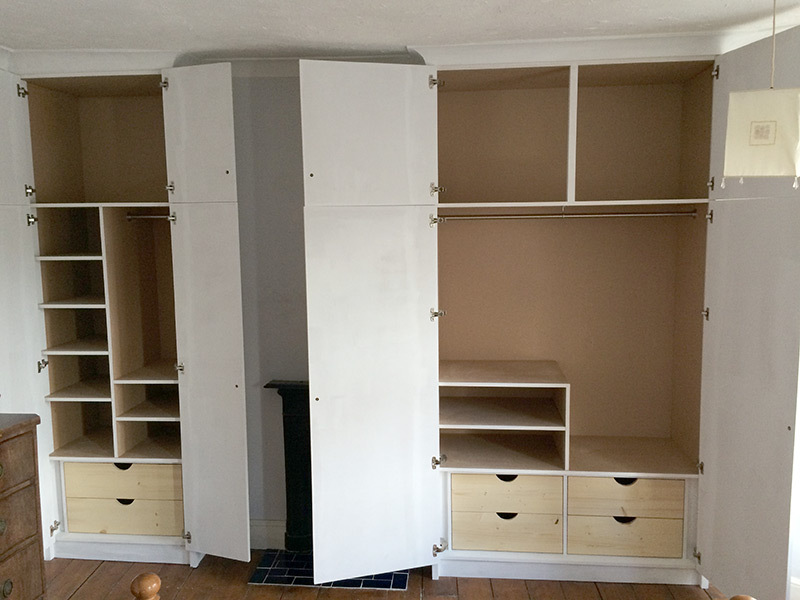 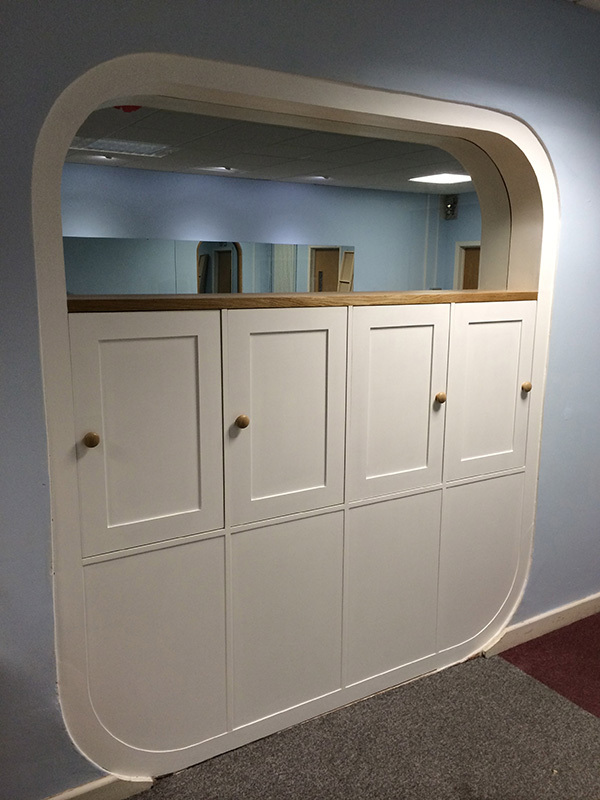 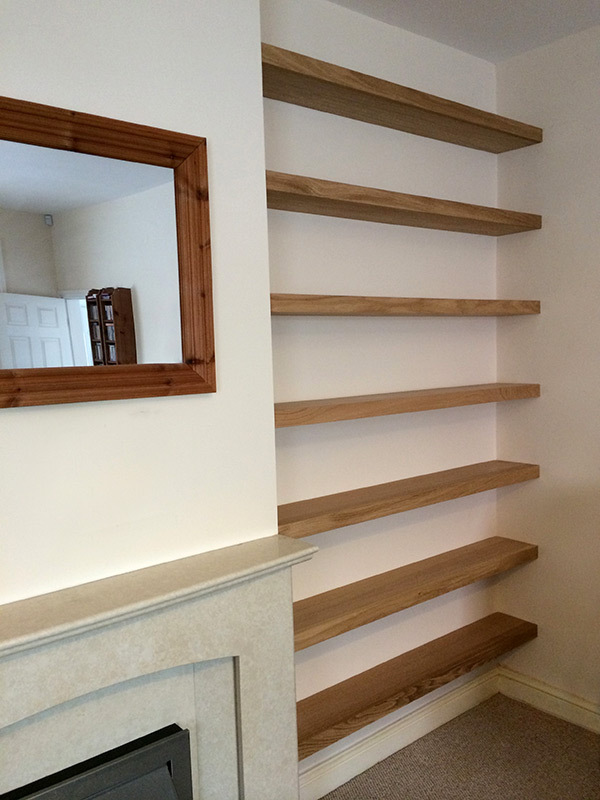 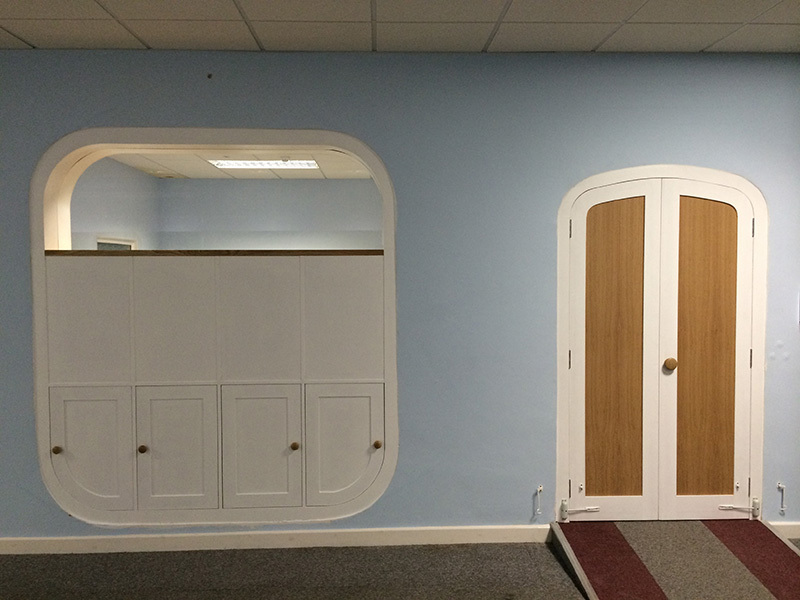 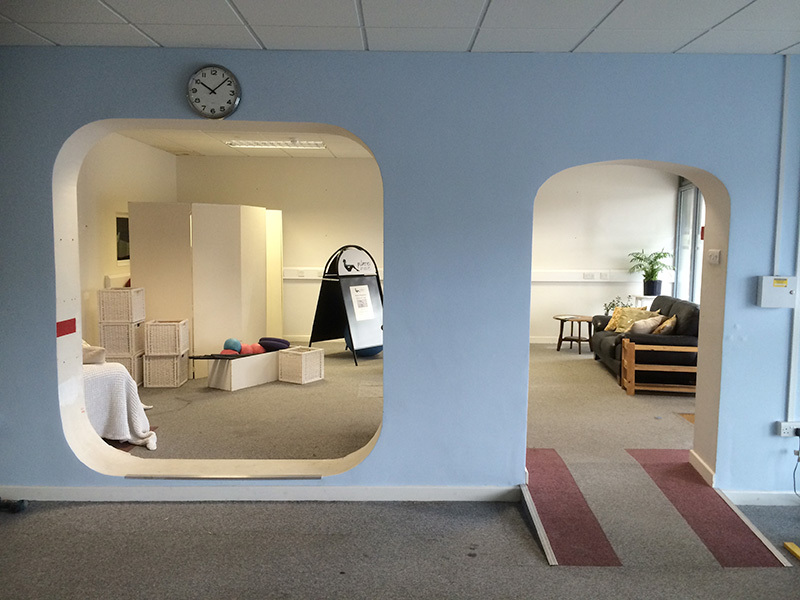 This unit was to fit into this unusually shaped opening in a wall that divided two rooms in a Pilates studio in Bristol. 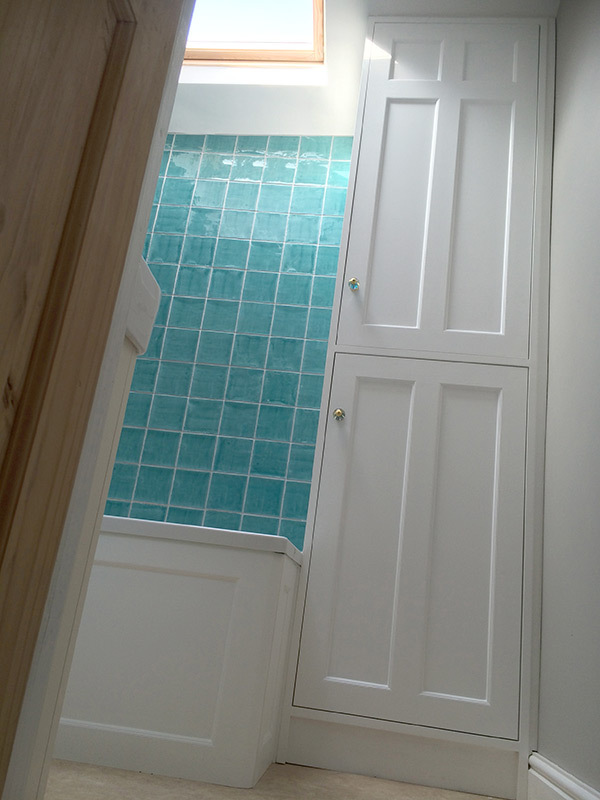 The brief was also to make it usable from both sides and to have an element of glass so that the rooms still felt partly connected. 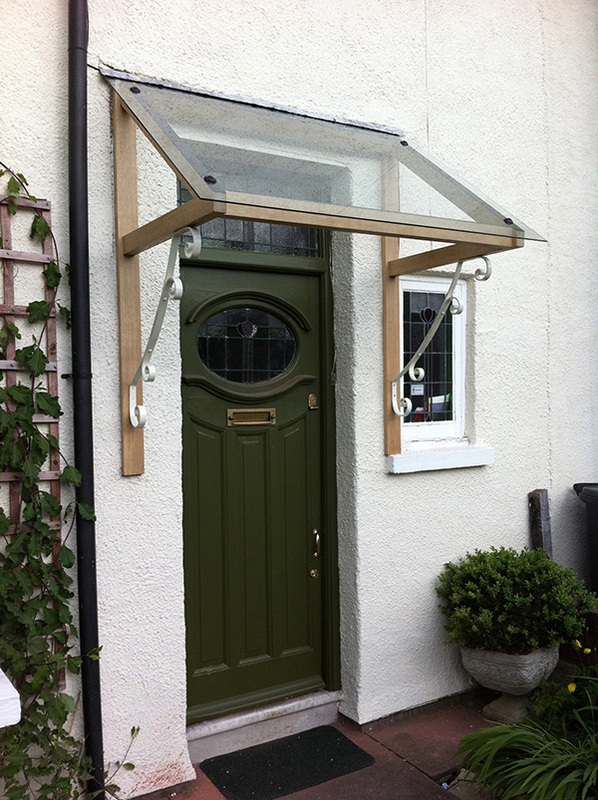 Hand-cut Oak frame with drilled, toughened and laminated clear glass sheet. 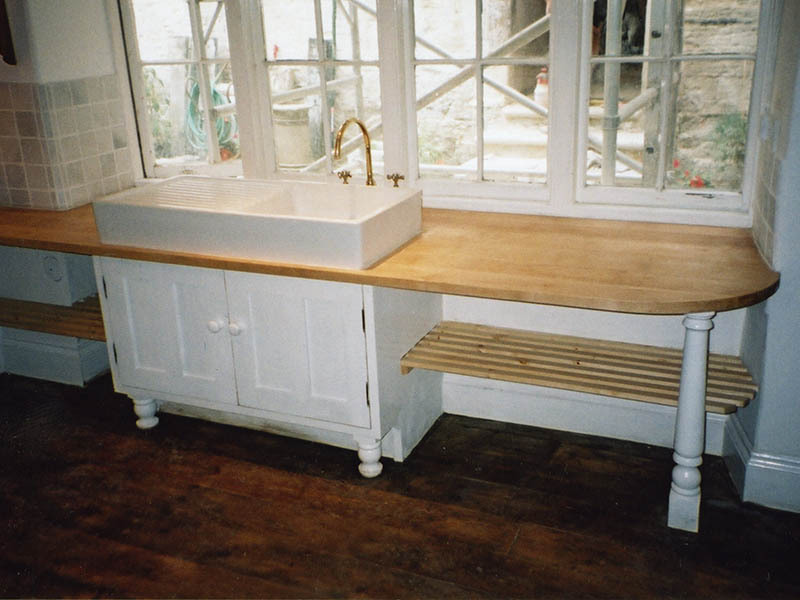 We used reclaimed pieces of furniture and some new components to create these two kitchens. 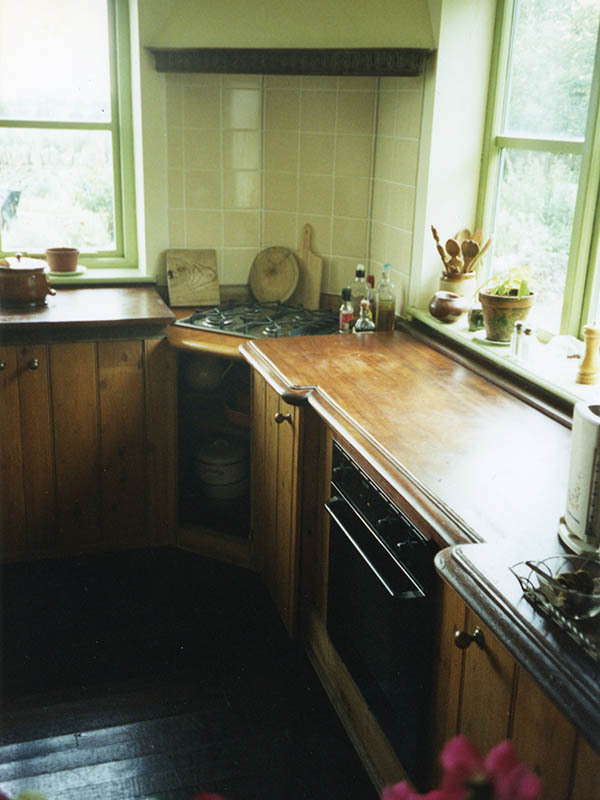 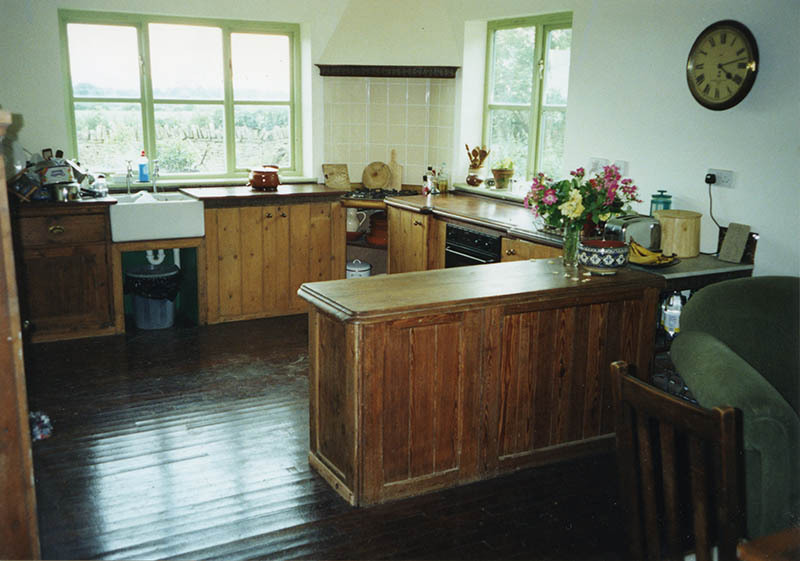 The oven and hob, for example, sit inside an old writing desk! 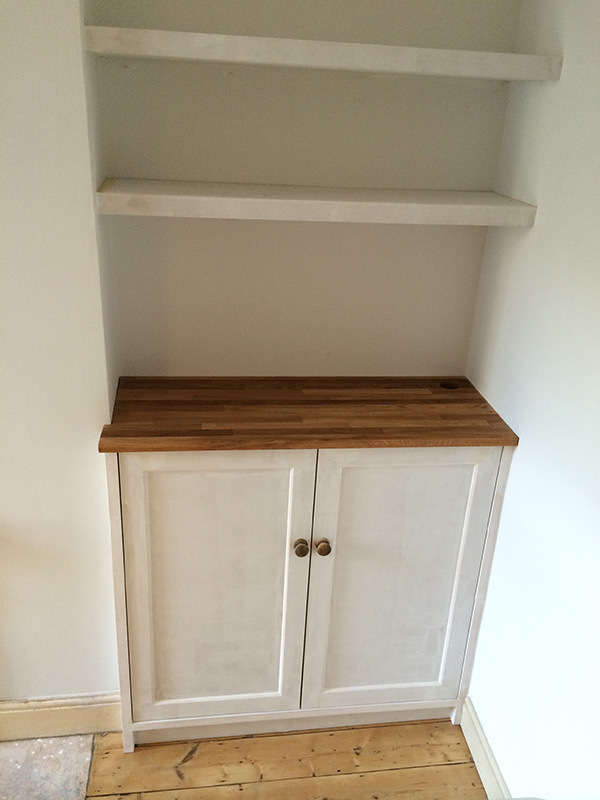 I recycled some old Cedar shelving to produce these cabinet tops and bookcases. 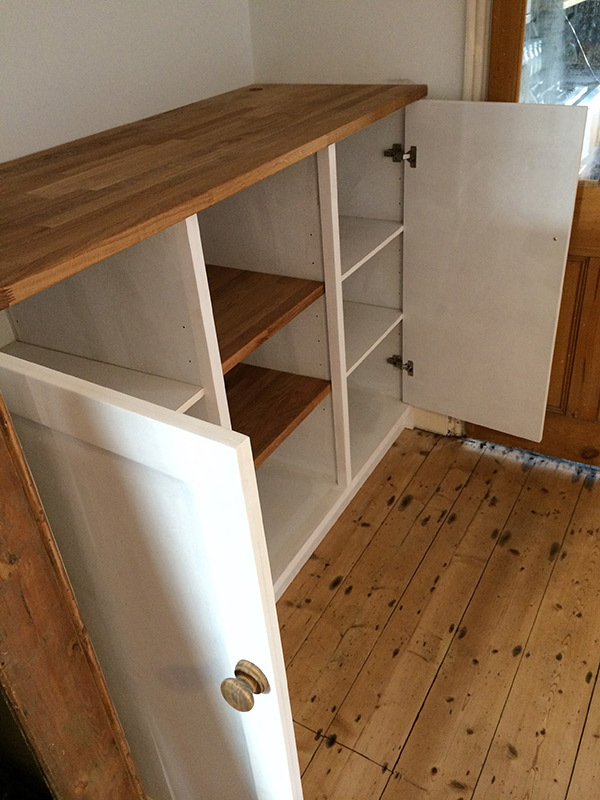 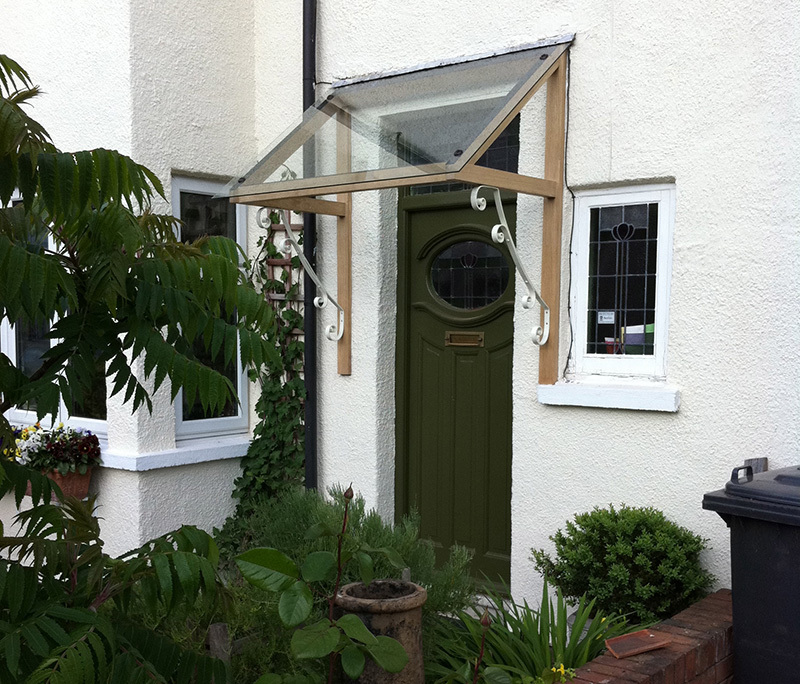 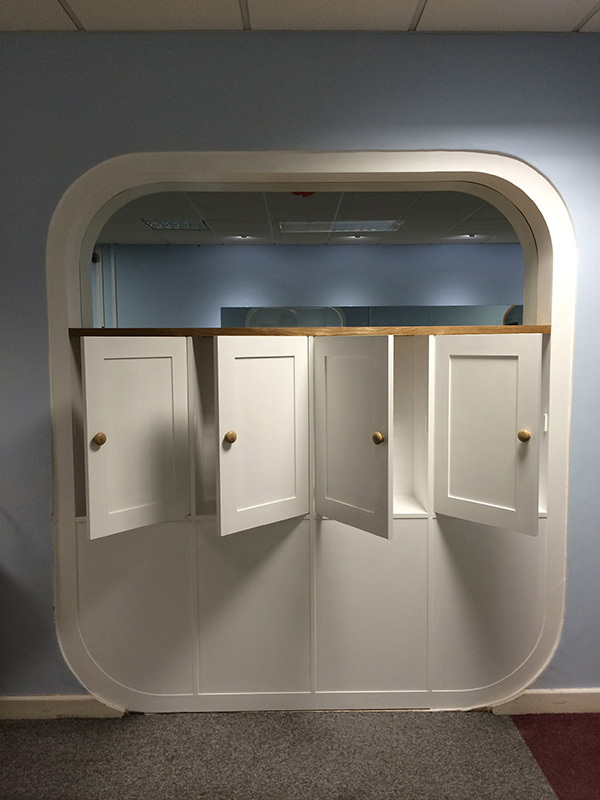 The doors were upcycled from some old cupboards that had been removed from another house. 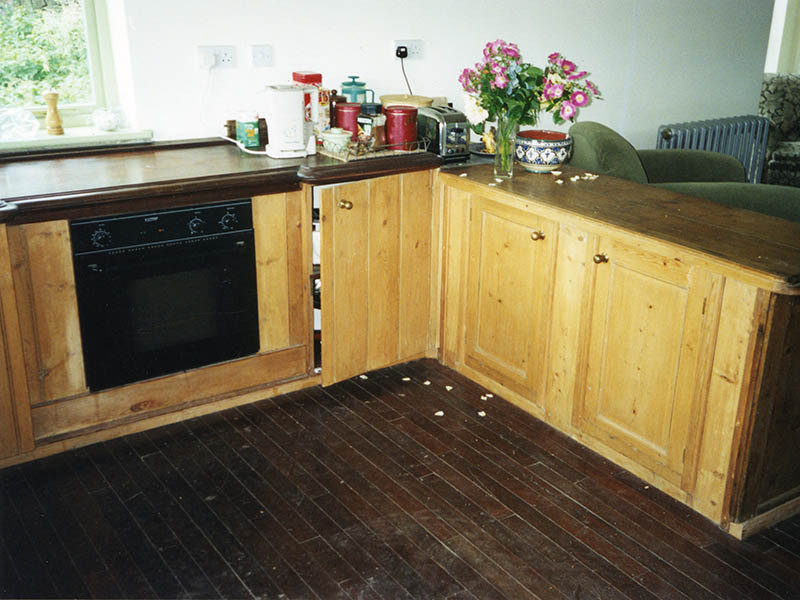 To finish I applied a subtle stain to all the timber. 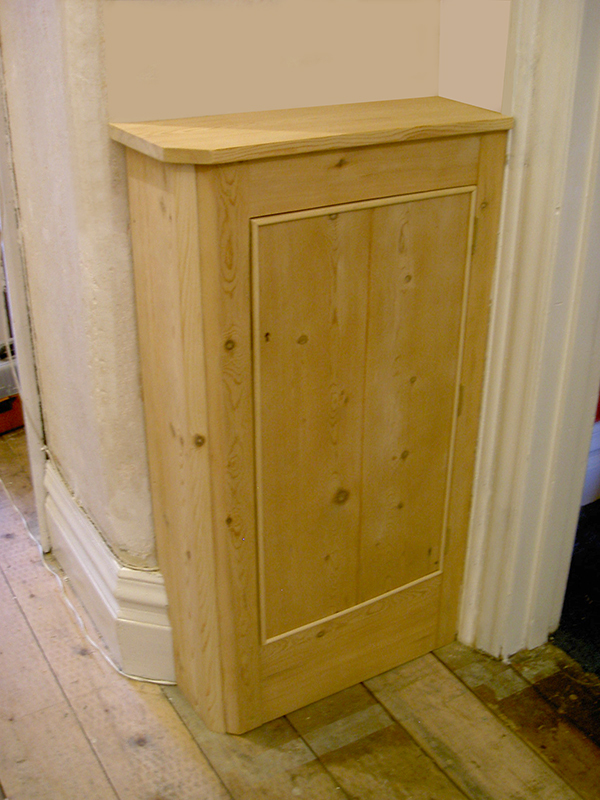 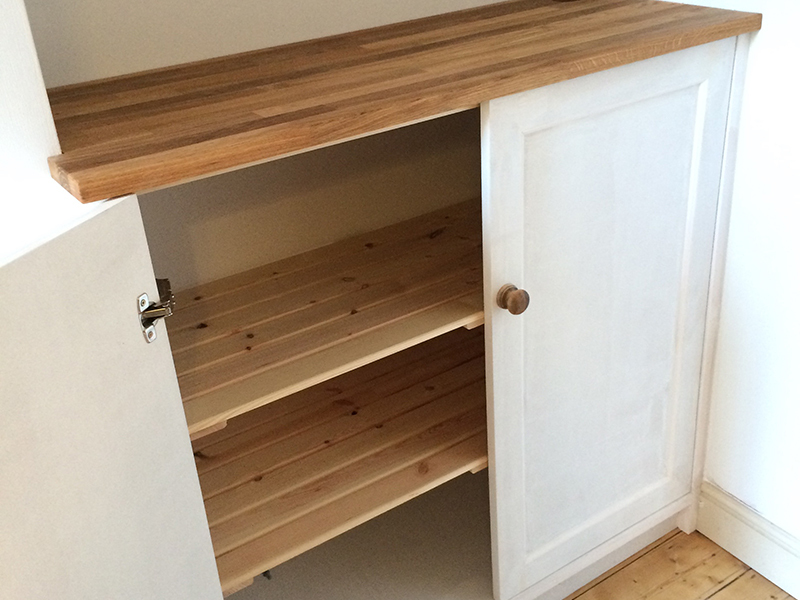 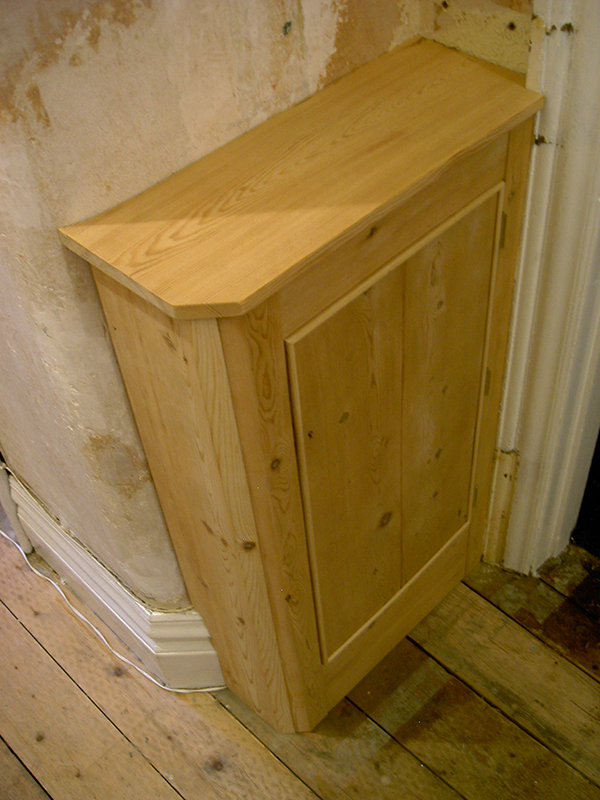 This cabinet is made from old recycled pine boards. 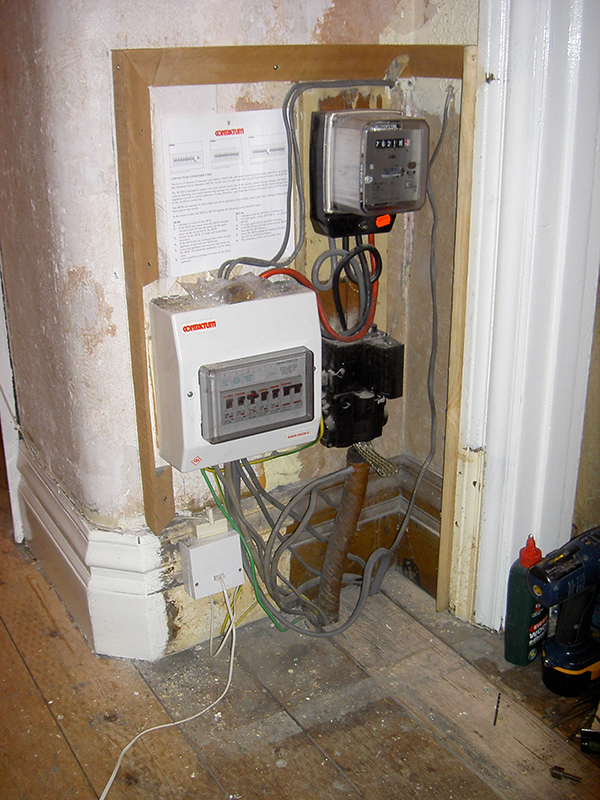 It has a lockable door and houses the electricity supply and consumer unit. 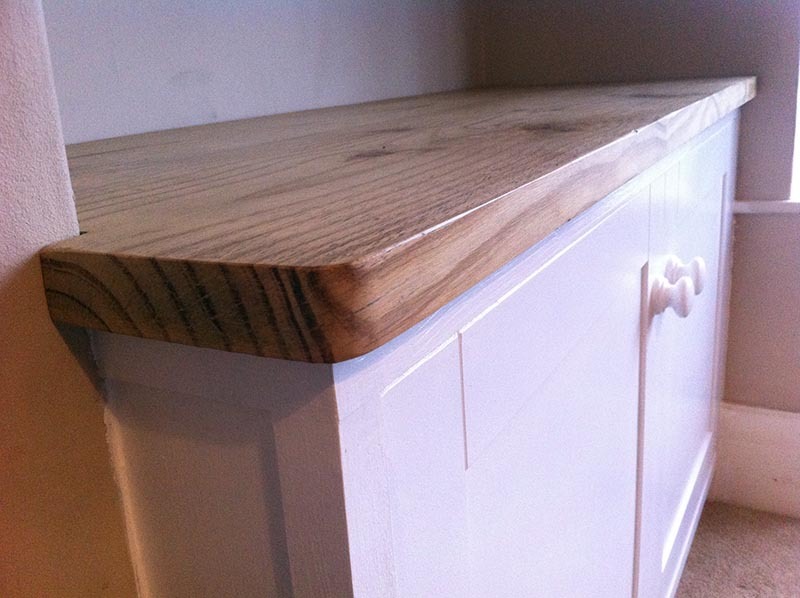 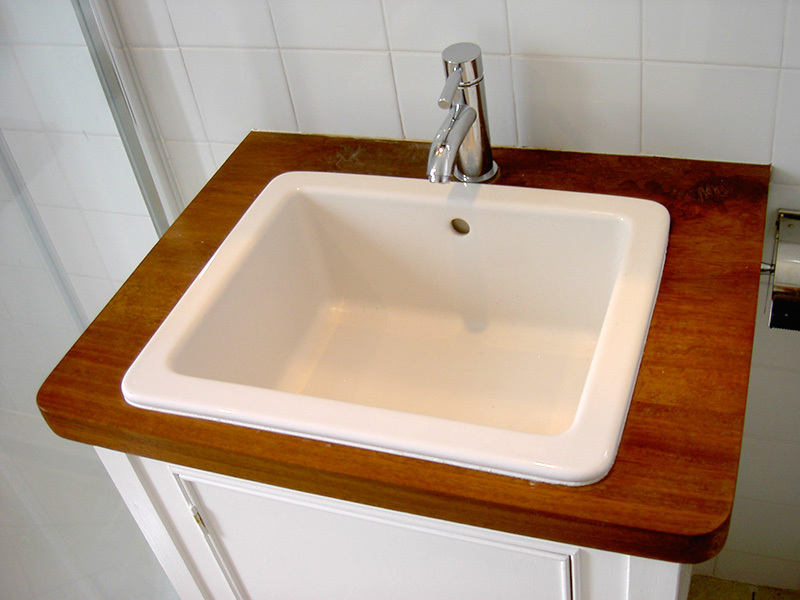 I restored this beautiful antique Pine tabletop and used it for the cabinet worktops. 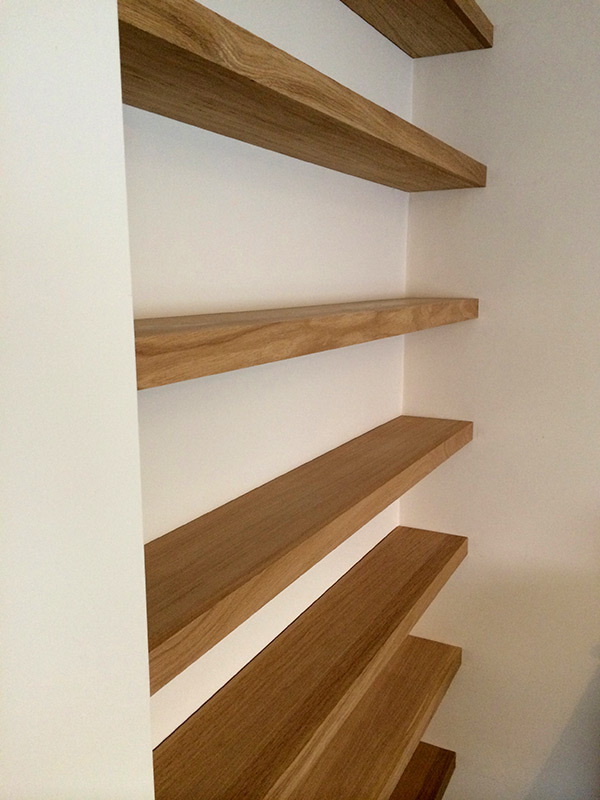 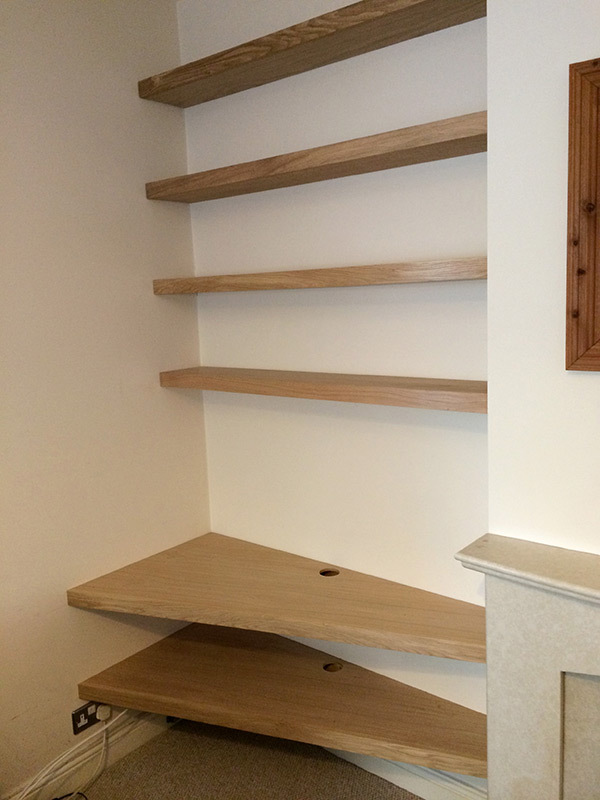 Softwood frame and MDF cabinets with floating MDF box shelving above. 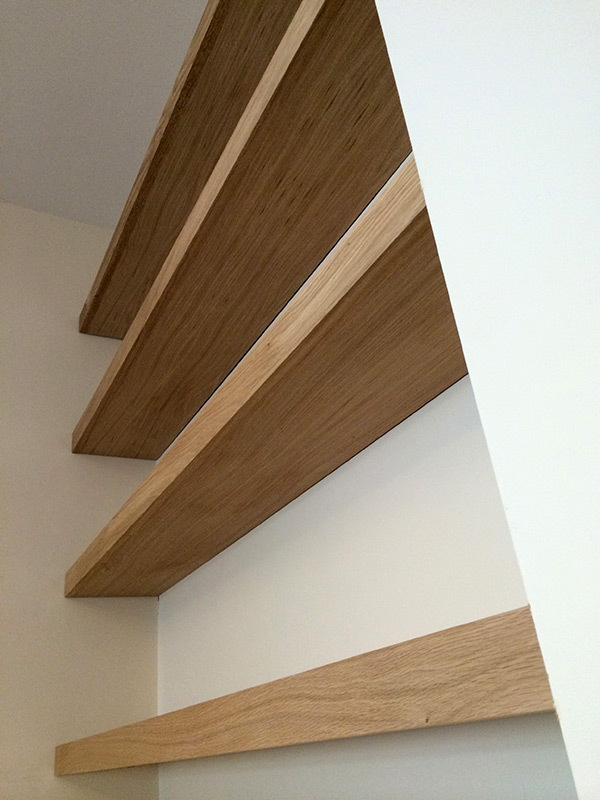 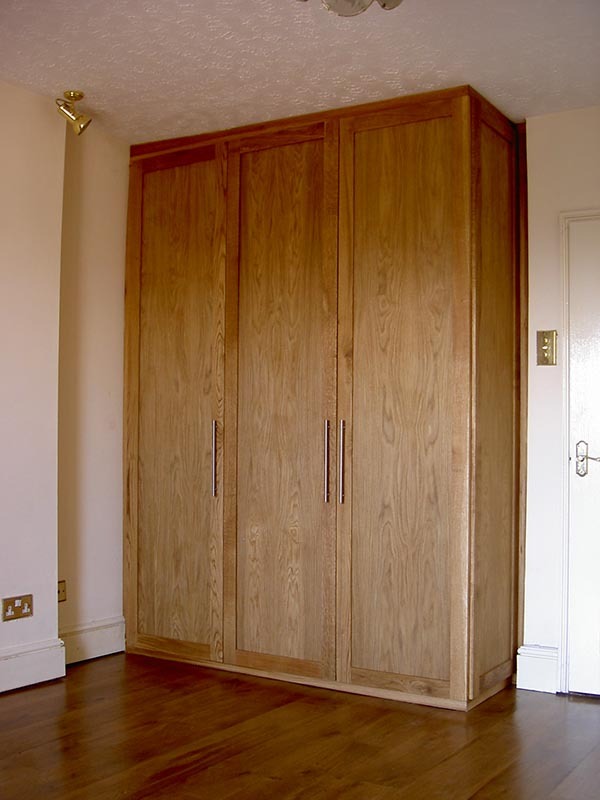 Very large fitted solid Oak and Oak veneered MDF wardrobes. 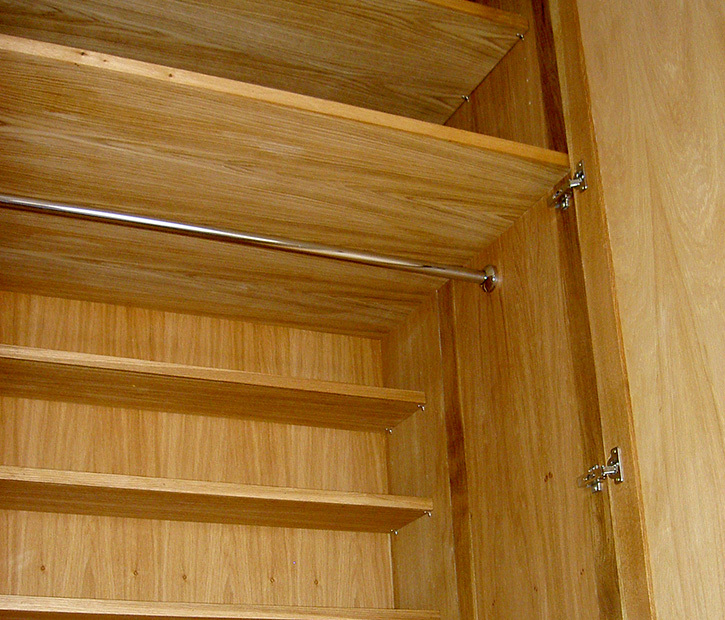 Large slide out box drawers on heavy-duty castors. 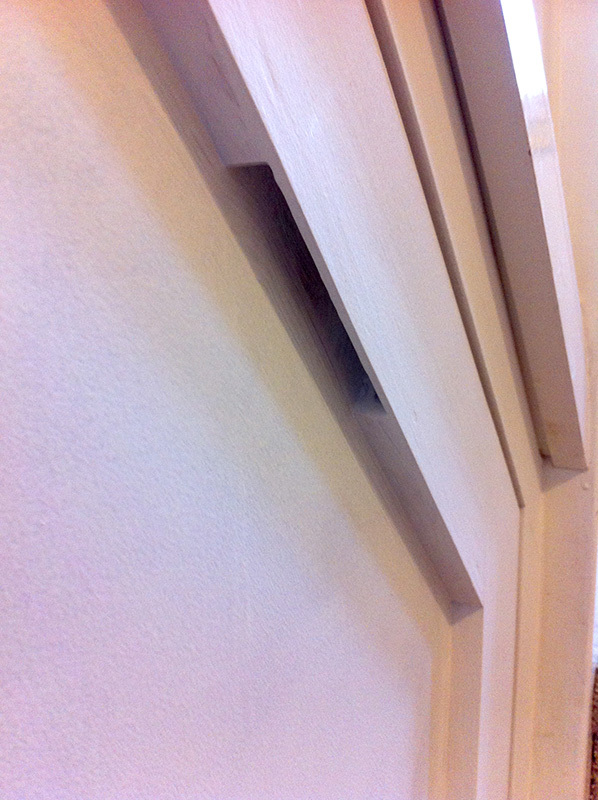 Painted softwood and MDF. 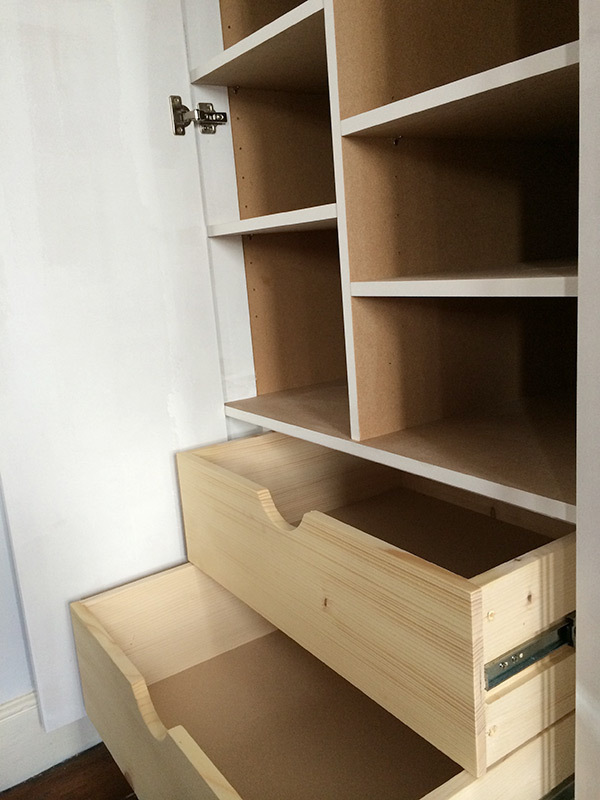 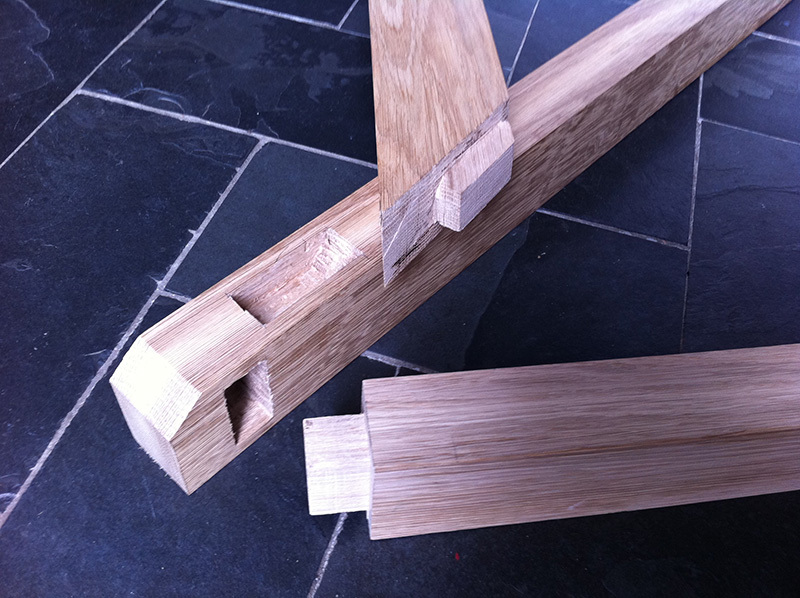 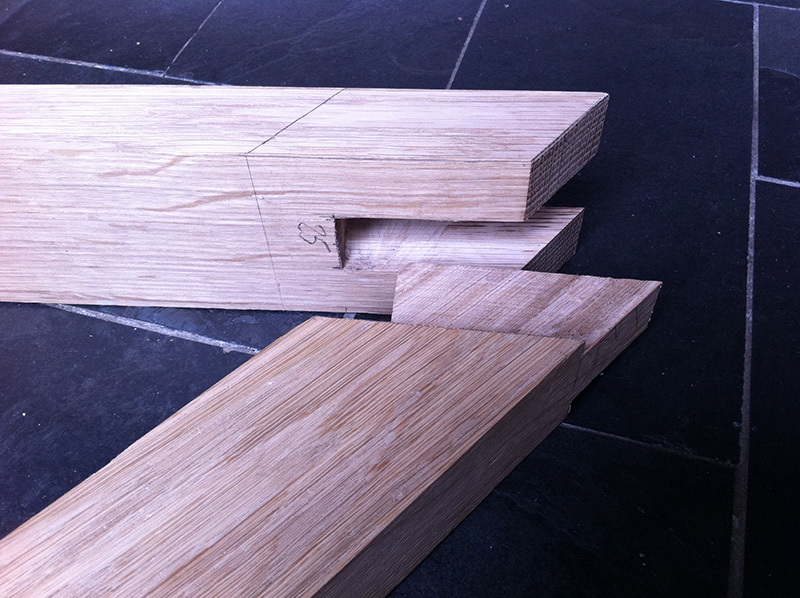 Hidden handles in drawer frames.